Go behind the scenes at Leeds Museums and Galleries! 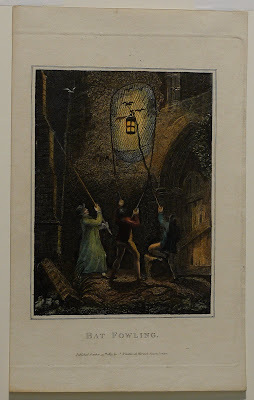 Bat Fowling; unknown to me until I caught sight of this coloured print dated October 30th 1813. Despite the name Bat Fowling is an old fashioned method of catching birds. In the dark of the night the bird seeker would light his torch near a roost which would wake the creatures from their slumber. Dazzled and confused the birds would fly toward the flames where they were easily caught in nets, or even beaten down. 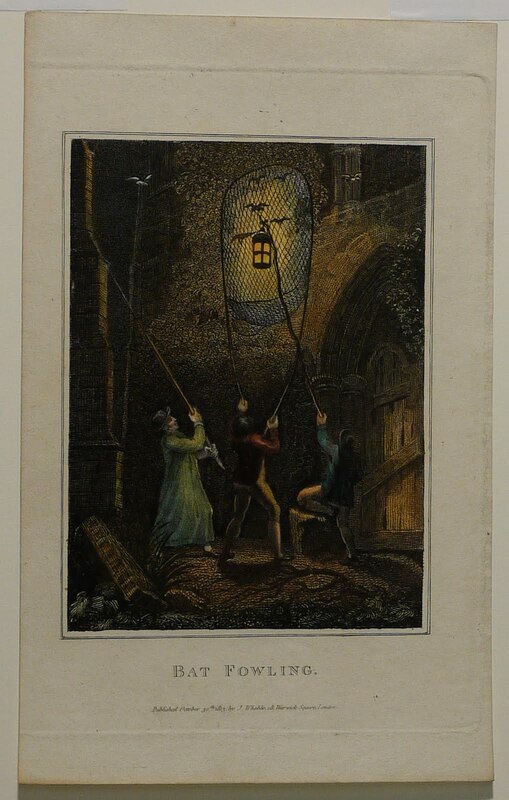 This print was published by John Wheble (active late 18th Century) of Warwick Square London, it is an etching on wove paper. Could you tell me when wove paper was first used by artists and printers, please? Thank you for your question. Generally speaking, in the chronology of papermaking within Europe, wove paper came after laid paper in around the mid to late 18th Century. Wove paper was first used in Europe around c.1750. John Baskerville of Birmingham printed his 'Vigil' using the newly invented paper in 1757. Nevertheless wove paper had been made in China hundreds of years previously to its rediscovery in Europe. Soon after Baskerville published his famous edition of 'Vigil' wove paper became very popular across Europe. By the 1780s the manufacture of wove paper had spread quickly across England – and it wasn’t long before the English papermills felt the encroaching heat of the Industrial Revolution. The papermaking craft soon became mechanised within the turn of the19th Century, and generally speaking, has not looked back. I recently had the desire to re-visit traditional papermaking techniques – possibly recreating the papers of Turner say. What do you suppose they were doing with the birds? Was this an example of early pest control? Were they sonngbirds to be sold in cages or baked in a pie? A curious bunch those late Georgians! All those things - but above all - bird pie. I am not sure. Have you come across Bat Fowling before?